R&S SpycerNode offers a new and radically different approach to the broadest range of broadcast & media storage requirements. Following a successful technology showcase and system launch at IBC 2018, Rohde & Schwarz has announced the commercial availability of its new media storage system called R&S SpycerNode. The company reports that the system offers a new and radically different approach to the broadest range of broadcast & media storage requirements. At its debut at IBC this September, R&S SpycerNode caught the eye of many media storage experts. One of these is Rohde & Schwarz UK reseller, Jigsaw24, which helps promote the latest technology in the creative industries and driving IT in enterprise and education. “Due to the flexibility of the product line we will be offering R&S SpycerNode to all our high-performance video editing customers,” Watson confirmed. 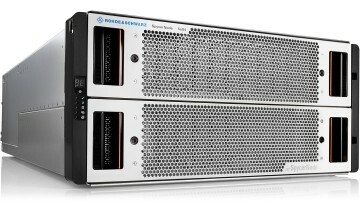 In developing R&S SpycerNode, Rohde & Schwarz engineers have looked at many of the key issues that impact on media storage systems within high-performance video editing environments from annoying maintenance requirements – such as defraging – to much more serious system failures including dying disk drives, which can have catastrophic consequences to a project that is being worked on. R&S SpycerNode features Rohde & Schwarz‘s device manager web application which makes it much easier to set up and use Rohde & Schwarz solutions in an integrated fashion. Device manager helps to reduce setup times and simplifies maintenance and service due to its intuitive web-based UI operated through a single client. A critical requirement of any high-performance video storage system is proven data security. In developing R&S SpycerNode, Rohde & Schwarz has introduced data protection systems based on erasure coding and declustering. Erasure coding means that a data block is always written including parity. Declustering is a part of the data protection approach of HPC setups (formerly known as RAID). It is software based and in comparison to a traditional RAID setup the spare disk is spread over all other disks and is not a dedicated disk. This will decrease rebuild times and reduce performance impact. Also, there are no limitations with the RAID controller, which results in much higher IOPS (Input/Output operations per second). Importantly, there is no impact on system performance over time due to declustering. R&S SpycerNode comes in multiple 2U and 5U chassis designs, which are available with NL-SAS HDD and SAS SSDs in different capacities. An additional 2u24 chassis design is a pure flash system. There are main processor units and JBOD units. A main unit is always redundant, equipped with two appliance controllers (AP). Each AP features two 100 Gbit interfaces resulting in four 100 Gbit interfaces per main unit. The combination of different chassis systems makes R&S SpycerNode applicable to a very broad range of applications. The 2u system represents a compact, lightweight unit that is ideal for application within mobile productions as well as offering a very dense, high speed storage device for on-premise applications. A larger 5u system offers sophisticated large-scale storage facilities on-premise within broadcast production centres and Post facilities.